Do you have a special event coming up that could be made memorable with a custom dance? First dances can be a daunting part of the best day of your life, especially if you or your partner are not the most confident of movers. I offer bespoke choreography sessions to ensure the two of you create a performance to be proud of. Tell me the music and the feeling you are looking for and I will do the rest. In a relaxed, fun environment, your first dance can be a chance to spend quality time together and learn a new skill before the big day. Dances can also be choreographed for hens/ groomsmen/ guests. Get creative and make your day stand out! Flash mobs can be a great way to grab attention or surprise your audience. The first flash mob I choreographed was for a surprise 50th birthday and all of the family came to secret sessions to learn a dance and show the very lucky recipient how much he means to them. I have also choreographed flash mobs for festivals, launches and parties. 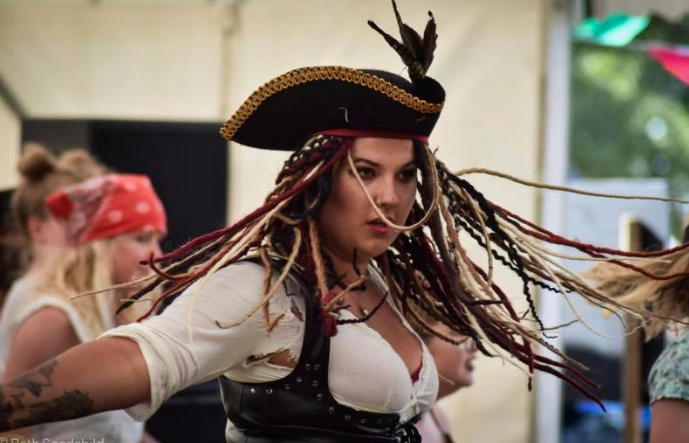 Most recently I choreographed and performed a Pirate flash mob for Nibley festival, this was met with a great response and I am already planning for next year-’OUT OF THIS WORLD’ theme, book your tickets now! Let me know your ideas and contact me fast as flash mobs require skill, time and a lot of imagination. As previously mentioned, a dance number is a great way to WOW your guests. Dance can move an audience in many ways, laughter, joy, tears. If your event could be enhanced with a performance, contact me and see what we can do! This summer, Keziah will be delivering dance-in-a-day workshops in schools for their activities week. These sessions can be catered to fit with a theme/ assembly. Keziah has led special dance workshops for school activity weeks (a particular favourite was based upon ‘Around the world in 80 days’). Keziah can also deliver specially curated workshops for SEN schools and has worked within most SEN schools in the county to deliver high quality workshops. These can be pure dance, narrative or sensory-led story explorations dependant on your requirements. To book a session at your school, drop me a message.